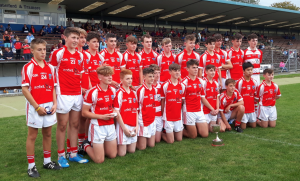 It was another hugely positive day for the Cork Underage Development Squads participating in Hurling Tournaments across Munster last weekend. The young Rebels were looking to reclaim all seven titles having recorded a clean sweep in 2015. ALL seven representative sides progressed to their respective finals, while four teams became champions. Congratulations to the Under 14A side, Under 14B, Under 15B and Under 16A's. Full details fromthe day on Rebel og here .